Twenty years into their career as one of the leading rock bands in the world, Foo Fighters continue to find ways to challenge both themselves and their listeners. On "Sonic Highways," a companion to the similarly named HBO television series, the Dave Grohl-fronted band, with assistance from producer Butch Vig, tasked itself with touching down in eight U.S. cities, exploring each town's music history, and then writing and recording a song in that city influenced by what they discovered, often accompanied by a native son or daughter. To its credit, the band avoids gimmickry. For example, in New Orleans, it recorded the mid-tempo "In The Clear" with the legendary Preservation Hall Jazz Band, but no one will mistake the tune for a typical Crescent City brass band parade. 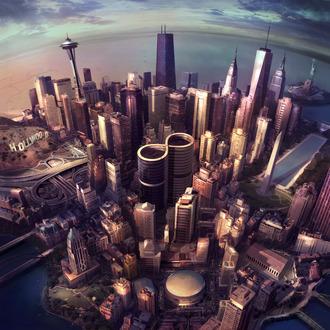 Instead, each city's elements are incorporated into the Foo Fighters' sound. That's not to say they didn't find inventive ways to salute each locale. On the album's best track, the thoughtful, driving "Congregation," which features Zac Brown and was recorded at his Southern Ground studio in Nashville, the lyrics include "singing like a bluebird in the round," a reference to famous songwriter venue, Bluebird Cafe. On the aggressive power pop of "What Did I Do/God As My Witness," recorded in Austin, Grohl brings up the 13th floor, an insider reference to The 13th Floor Elevators, the influential-ye- obscure Roky Erickson-led psychedelic '60s band from the Texas town. Such little treats exist in almost every song. What has always made Foo Fighters' music so appealing is that for all the metal bombast and thrash, the noise rarely comes at the sacrifice of melody. That remains truer than ever on this very worthwhile trip through America's musical wonderland.